About LDN: FDA-approved naltrexone, in a low dose, can boost the immune system — helping those with HIV/AIDS, cancer, autoimmune diseases, and central nervous system disorders. In May 2006, clinical trial researchers at Pennsylvania State University College of Medicine reported: "LDN therapy offers an alternative safe, effective, and economic means of treating subjects with active Crohn's disease." Other physicians and researchers have described beneficial effects of LDN on a variety of diseases, including Multiple Sclerosis (MS), Pancreatic Cancer, HIV/AIDS, ALS (Lou Gehrig's Disease), Autism Spectrum Disorders, Behcet's Disease, Irritable Bowel Syndrome (IBS), Parkinson's Disease, Psoriasis, Rheumatoid Arthritis, Systemic Lupus (SLE), and Wegener's Granulomatosis. 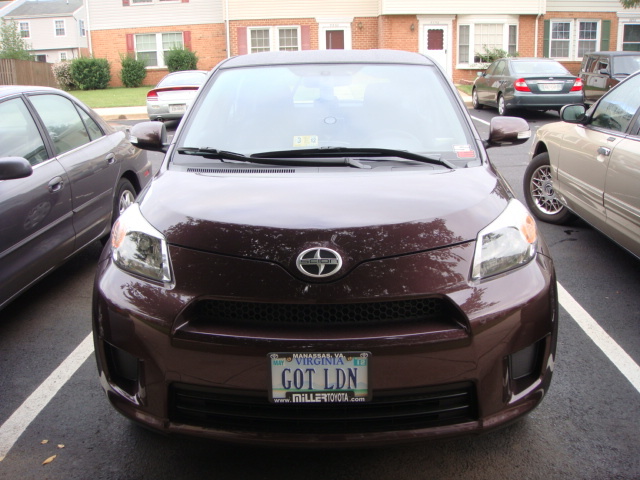 I wanted to do my part in raising awareness for LDN (Low Dose Naltrexone), so last week I ordered personalized license plates for the xD, they came in the mail yesterday. 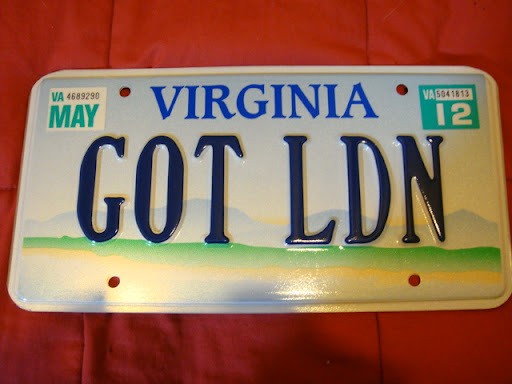 Hopefully, someone will be curious enough to ask me what LDN is. I have now been taking 4.5 ml of LDN for seven months. Originally I started taking it to keep pre-cancerous cells that had been removed twice from coming back. Hopefully, it's working to do that. It's costing me $18.90 a month without insurance. Taking LDN all these months has given me some really nice side effects. I have not had a cold since, no more migraines, I have more energy, get the best sleep, and the pain in my elbows due to bone spurs is completely gone. There is one more side effect that I realized two Friday's ago. Back in March, I had bought a rebounder, you know, the indoor trampoline. I set it up in my room and started to jump on it. After jumping a few times I urinated all over myself. I couldn't help it, I had no control. It was the most awful feeling I ever had and I felt absolutely helpless. It's a horrible, horrible feeling to not have control over your own body. I put the rebounder away. I had issues with urinating just a little bit when sneezing, coughing, or laughing for the last 5 or 6 years and my doctor had told me before that there is surgery for that, or drugs that can help, but I didn't want the drugs or them cutting on me anymore. Five of us share my home. In the last couple of months, everyone living in my household has started taking LDN and everyone has gotten amazing benefits from its use. As of four days ago, my son is taking it again. He's starting out slowly at 1 ml a day working up to 4.5 ml. He lost patience the first time, back in March and was in so much pain that he decided to try the pain medicine instead. Also, I was just learning about this drug myself. Some people feel immediate relief of symptoms with LDN and with some, it takes weeks to months. There are very few side effects, which are temporary, like having vivid dreams, not being able to sleep well and some people have nausea. This usually passes in a week or so. Each person is different, I had no side effects at all when I first started taking it. If you are sick, or sick and tired of being sick and tired and the doctors are not helping you get better, research LDN. If your quality of life has been reduced to crap, research LDN. It is inexpensive and will not hurt you and what have you got to lose? I belong to a great group of almost 500 people on a Facebook page called "Got Endorphins? LDN (Low Dose Naltrexone)" All of us are taking LDN and all of us have different issues, from cancer, MS, Fibro, Crohn's, to allergies and sinus problems. If anyone has questions we are more than happy to help. I know I sound like a commercial, but isn't it worth a try? It's an old drug, it's off patent, it has almost no side effects. Big Pharma is not interested in dumping millions of dollars into trials for this drug since it won't make them a profit. Most important, it will do no harm! ITVs Dr. Chris Steele Urges UK Citizens to sign the petition to 10 Downing ! More videos of yesterday's LDN Conference in Dublin, Ireland by Brendan Quinn. He will upload more today. Subscribe to it! !